Specialities: low back (lumbar), mid-back (thoracic), neck (cervical), shoulder, elbow, wrist, hips, knee or ankle. Years in practice: 2 years. Accolades: Professor at both Bryant & Stratton and Niagara Community College. M1 Graston certified, knowledgeable in trigger point therapy, ultrasound, electric muscle stimulation, flexion distraction, Muscle Release Technique, diversified technique, Gonstead technique and Sacro-Occpital Technique protocols. 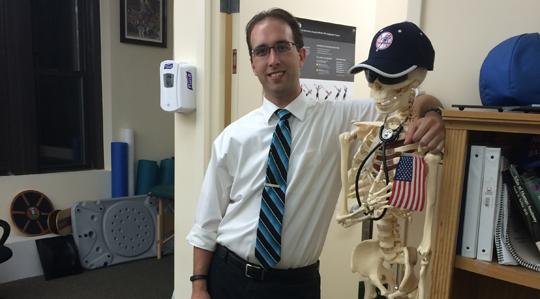 Dr. Christopher Herrington loves what he does, he is fascinated by movement and the mobility of the human body. Chris Herrington, DC is a born and raised Buffalonian and he understands paying bills and living in Buffalo is tough for blue collar workers everywhere. He himself worked in a large factory on Grand Island alongside his brother. He has spent long back breaking hours standing working in retail during high-school and undergraduate college. A Lockport native, Dr. Chris Herrington finished his doctorate at D’Youville College. He loves helping his patients but would rather help people without judging them or penalizing them when they are just trying to maximize their best health, without breaking their bank accounts. Dr. Herrington loves being a chiropractor. Chris has been described as a “One of the best chiropractors I’ve ever encountered” by orthopedic surgeon Dr. David Ratliff. It is his passion for chiropractic that has led him to consistently study new treatment techniques and to strive to keep his care affordable to all who seek to improve their overall health. A professor at both Bryant & Stratton and Niagara Community College, Dr. Herrington is an expert in musculoskeletal medical conditions, specifically related to problems with the back, neck, and spine. Chris enjoys teaching students and patients about complex medical conditions such as sciatica, spinal stenosis, disc herniations, headaches and migraines. When choosing a chiropractor, why settle for one that you’ve heard is just “good”? Why not select chiropractor Chris Herrington, who loves what he does, who loves helping others, who enjoys teaching / explaining / educating others about his profession & techniques, has proven relationships with local orthopedic specialists. Dr. Herrington provides treatments for pain in the low back (lumbar), mid-back (thoracic), neck (cervical), shoulder, elbow, wrist, hips, knee or ankle. Dr. Herrington is M1 Graston certified, knowledgeable in trigger point therapy, ultrasound, electric muscle stimulation, flexion distraction, Muscle Release Technique, diversified technique, Gonstead technique and Sacro-Occpital Technique protocols. You’re best health and back pain solutions are just around the corner. Call 716-308-2881. A Lockport native, Dr. Chris Herrington finished his doctorate at D’Youville College. Dr. Herrington is a FAKTR certified chiropractic professional.